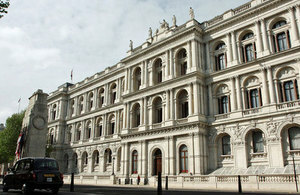 A look at news from the Foreign Office and its embassies overseas this week. Main news this week is the first ever official Papal visit to the UK. Pope Benedict XVI arrived yesterday in Scotland and is spending today in London. This week the Foreign Secretary delivered his third in a series of four speeches on the Government’s foreign policy. In a speech called “Britain’s values in a networked world” the Foreign Secretary said it is not in our character as a nation to have a foreign policy without a conscience, and niether is it in our interests. Yesterday, he attended the European Council with the Prime Minister where they agreed new measures to help underpin Pakistan’s recovery and future development. Foreign Office Minister Alistair Burt travelled to the United Arab Emirates where he led the UK delegation for the second meeting of the UK-UAE Taskforce with UAE Minister of State, Dr Anwar. Continuing his visit of to the Far East, Foreign Office Minister Jeremy Brown visited China. In a video clip recorded at the end of his visit the Minister discussed the importance of UK-China relations. Minister for Europe David Lidington published a written statement providing an update to the House of Commons on progress made in preparing the EU Bill. The Foreign Secretary made a statement after the Burmese regime dissolved Aung San Suu Kyi’s National League for Democracy and rejected the registration of five ethnic parties. Afghanistan’s Parliamentary elections take place tomorrow. Officials from the British Embassy in Afghanistan have travelled to different parts of the country to find out how the Afghan authorities and candidates have been preparing for elections.